Selective Decolor can be used to selectively remove some colors from an image while preserving the rest; leaving an image that is partially colored and partially black and white. It can also be used to selectively desaturate some colors for either corrective or artistic purposes. 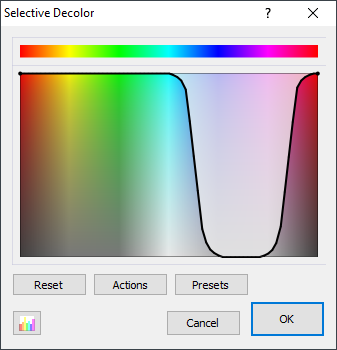 You can freely fine tune the level of desaturation applied to every color/hue by adjusting the transfer function, which is represented as a graph of output value against the hue of the input. The graph uses for the transfer function doesn't have control points like the ones used by the curves adjustment. To adjust the graph, just click and drag to draw the desired response curve. To edit a range, click and drag on the color-bar at the top to select, then drag up and down on the main box to set the value. You can perform various actions, such as inverting the curve or smoothening it out, by clicking the button labeled “Actions” and selecting the desired action from the resulting popup menu. You can also load presets by clicking the button labeled “Presets”, which will bring up a popup menu with various presets.